Ever wondered who scored the first goal in the World Cup? Can you name the player who was shown the first red card in the World Cup? Can you name the dog who found the stolen World Cup Trophy in a garden? Have you heard about the Battle of Berne? 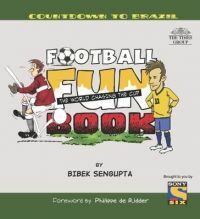 This book has the answers to all these fascinating questions and contains stories, humorous incidents, records, trivia, facts and figures from the most watched football tournament in the world today. A perfect companion during the FIFA World CupTM.